• Drinking water protection – unsealed wells are direct channels for contaminates to travel through aquifers. This can affect private and community water supplies. • Safety – abandoned wells that are left open covered with unsecured objects or left in despair are hazards to people and animals. • Eliminate or reduce liability – State law states that landowners can be liable for groundwater contamination and can be required to provide compensation to affected neighbors. • It’s the Law! – Illinois requires wells to be sealed within 30 days of abandonment. 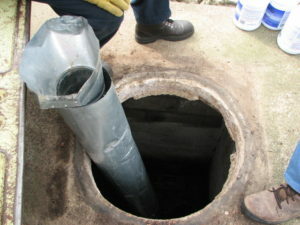 The District is participating with the Illinois Department of Agriculture to seal abandoned wells. This cost–share amount is not to exceed $300.00 or 60% of the actual cost, whichever is less. 1. Visit the Stephenson County Environmental Health Department at 295 W. Lamm Road in Freeport. Discuss the proper procedure for sealing the well with Ed Specht. 2. 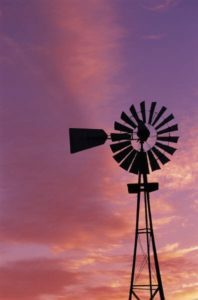 Fill out the Water Well Sealing Application and pay the $50.00 fee. 3. 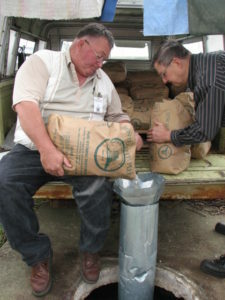 Ed Specht will help the well owner determine the amount of bentonite required to seal the well. This is determined by the diameter and depth of the well. 4. Determine if the well will be sealed by a well driller or the home owner. 5. Set up the date and time for the well sealing. The Stephenson County Health Department must sign off that the well has been sealed correctly. 6. If interested in cost assistance to seal the well, visit the Stephenson County Soil & Water Conservation District 1620 S. Galena Avenue, Freeport and complete the application form. 7. The well sealing project must be approved by the SWCD Board of Directors prior to sealing the well to receive these funds. 8. Purchase the bentonite needed to seal the well and complete the proper sealing procedure outlined by Ed Specht. 9. Return all bills associated with the cost of sealing the well to the Stephenson SWCD and sign the Participant Completion Certification on the application form, showing the work has been completed. 10. Once the final report from Ed Specht is given to the Stephenson SWCD the application will be submitted downstate for approval. 11. Once approval for project is given, a check will be sent to the well owner for the proper payment amount outlined above. Highest priority will always be assigned to private water wells posing the greatest risk. 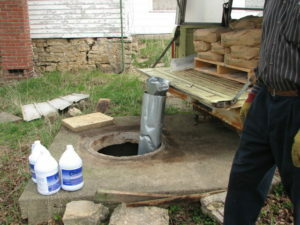 The wells are sealed with the cooperation of the Stephenson County Environmental Health Department.